On May 30, 2012, the Seventh Circuit Court of Appeals, in a powerful decision written by Judge Diane Wood, and joined by Judge Joel Flaum, a former federal prosecutor, and Judge Michael Kanne, a former City Attorney, denied immunity to police officers from downstate Paris Illinois, Edgar County States Attorney Michael McFatridge, and numerous Illinois State Police (ISP) officers. The 47 page opinion recognizes that the evidence wrongfully convicted Plaintiffs Randy Steidl and Herbert Whitlock presented to the Court was compelling, and supported a “deeply disturbing allegation: that police and a prosecutor conspired to frame two innocent men . 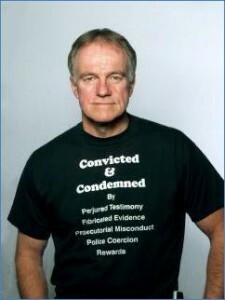 . . and over the course of the next two decades, state officials continued to cover up those misdeeds.” The decision has important implications for wrongfully convicted criminal defendants who are exonerated and sue prosecutors and other law enforcement officials under the civil rights statutes for fabricating evidence where those officials attempt to avoid responsibility for their actions by asserting immunity from suit. Steidl, who is represented by People’s Law Office attorneys Flint Taylor, Jan Susler and Ben Elson, is about to collect $2.5 million from the ISP defendants with whom he settled on the eve of the 7th Circuit argument last October. Herbert Whitlock is represented by attorney Ronald Balson. The case against the non-settling defendants is set for trial in October before Judge Harold A. Baker in U.S. District Court in Champaign Illinois. To read more about Randy’s case and our other Wrongful Conviction work, visit the Wrongful Convictions page on this site.